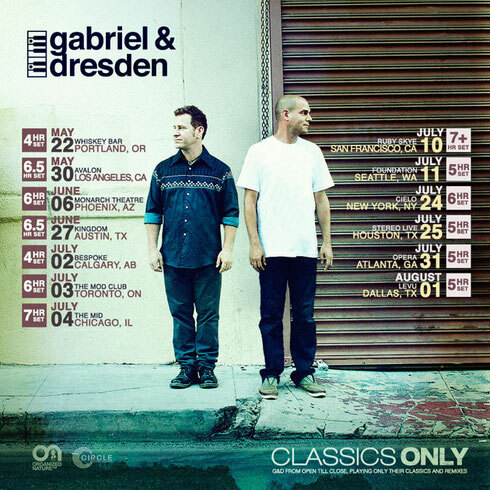 US-based duo Gabriel & Dresden are to spin their own music all night long at 13 stops across North America this summer, with 27 gigabytes of music, 13 tour dates and 6+ hours of self-produced classics. Taking you back to a time of sentimental music and open-to-close sets, the duo embark on their Classics Only Tour starting 16 May in Portland, hitting major cities throughout North America this summer. The beginning of their story isn't much different from any other in the industry... Josh Gabriel was an aspiring producer at WMC handing out his first vinyl record, and Dave Dresden was scouting new music for Pete Tong's radio show. But what came from this chance encounter would change dance music forever, as unbeknownst to them their lucrative partnership would turn into one of the most accomplished acts of the decade, with seven IDMA award wins (including two for "Best American DJ"), 19 Billboard #1 Dance Chart hits, and a loyal fan following that would become their biggest inspiration. Though at the time they were possibly industry leaders in their own right - with Josh's degree in music composition from California Institute of the Arts, engineering recording sessions at top LA studios and designing music software applications in Silicon Valley, while Dave got his 10,000 hours as a club DJ, radio programmer, A&R-man and journalist - together they combined this expertise to become a tour de force in dance music. The quintessential definition of what they've dubbed "Emotional Dance Music," their candid and unreserved approach has spawned an expansive discography of timeless classics for their fans to revel in, including ‘Tracking Treasure Down’, ‘As The Rush Comes’, ‘Beautiful Things’ and ‘Dangerous Power’, as well as newer tracks such as ‘Tomorrow Comes’ and ‘Rise Up’ from their Organized Nature label. Everybody from Britney Spears and Madonna to The Killers, Annie Lennox, Sarah McLachlan, Tiësto, Armin van Buuren and Above & Beyond have sought them out for official remixes, while the likes of Entourage, Nip/Tuck and Rockstar Games have licensed Josh & Dave's music to enhance their visual narratives. Gabriel & Dresden's contributions to music as a whole has both inspired and created fans out of many of today's biggest DJs and producers, and possibly carved them a place in electronic dance music history. "Our fans have been requesting a tour like this for years,” explains Dresden. "We felt like now was the right time to celebrate this music with the people who were there from the start while at the same time introducing these songs to a generation of new fans."